For other uses, see Special forces (disambiguation). "Crack-troops" redirects here. For the military formation, see Shock troops. Special forces and special operations forces (SOF) are military units trained to conduct special operations. NATO has defined special operations as "military activities conducted by specially designated, organized, trained, and equipped forces, manned with selected personnel, using unconventional tactics, techniques, and modes of employment". 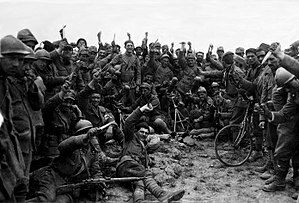 Special forces emerged in the early 20th century, with a significant growth in the field during the Second World War, when "every major army involved in the fighting" created formations devoted to special operations behind enemy lines. Depending on the country, special forces may perform functions including airborne operations, counter-insurgency, counter-terrorism, foreign internal defense, covert ops, direct action, hostage rescue, high-value targets/manhunting, intelligence operations, mobility operations, and unconventional warfare. In Russian-speaking countries special forces of any country are typically called spetsnaz, an acronym for "special purpose". In the United States the term special forces often refers specifically to the US Army's Special Forces, while the term special operations forces (SOF) is used more broadly for these types of unit. Other capabilities can include bodyguarding; waterborne operations involving combat diving/combat swimming, maritime boarding and amphibious missions; as well as support of air force operations. 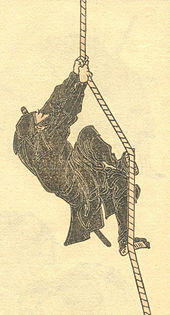 Japanese drawing of the archetypical ninja, from a series of sketches ( Hokusai manga) by Hokusai. Special forces have played an important role throughout the history of warfare, whenever the aim was to achieve disruption by "hit and run" and sabotage, rather than more traditional conventional combat. Other significant roles lay in reconnaissance, providing essential intelligence from near or among the enemy and increasingly in combating irregular forces, their infrastructure and activities. Chinese strategist Jiang Ziya, in his Six Secret Teachings, described recruiting talented and motivated men into specialized elite units with functions such as commanding heights and making rapid long-distance advances. Hamilcar Barca in Sicily (249 BC) had specialized troops trained to launch several offensives per day. In the late Roman or early Byzantine period, Roman fleets used small, fast, camouflaged ships crewed by selected men for scouting and commando missions. Muslim forces also had naval special operations units, including one that used camouflaged ships to gather intelligence and launch raids and another of soldiers who could pass for Crusaders who would use ruses to board enemy ships and then capture and destroy them. In Japan, ninjas were used for reconnaissance, espionage and as assassins, bodyguards or fortress guards, or otherwise fought alongside conventional soldiers. During the Napoleonic wars, rifle and sapper units were formed that held specialised roles in reconnaissance and skirmishing and were not committed to the formal battle lines. The British Indian Army deployed two special forces during their border wars: the Corps of Guides formed in 1846 and the Gurkha Scouts (a force that was formed in the 1890s and was first used as a detached unit during the 1897–1898 Tirah Campaign). During the Second Boer War (1899–1902) the British Army felt the need for more specialised units became most apparent. Scouting units such as the Lovat Scouts, a Scottish Highland regiment made up of exceptional woodsmen outfitted in ghillie suits and well practised in the arts of marksmanship, field craft, and military tactics filled this role. This unit was formed in 1900 by Lord Lovat and early on reported to an American, Major Frederick Russell Burnham, the Chief of Scouts under Lord Roberts. After the war, Lovat's Scouts went on to formally become the British Army's first sniper unit. Additionally, the Bushveldt Carbineers, formed in 1901, can be seen as an early unconventional warfare unit. The British Commandos were the prototype for the modern special forces. Volunteers had to undergo an arduous training course. Modern special forces emerged during the Second World War. 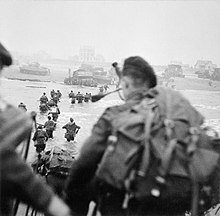 In 1940, the British Commandos were formed following Winston Churchill's call for "specially trained troops of the hunter class, who can develop a reign of terror down the enemy coast." A staff officer, Lieutenant Colonel Dudley Clarke, had already submitted such a proposal to General Sir John Dill, the Chief of the Imperial General Staff. Dill, aware of Churchill's intentions, approved Clarke's proposal and on 23 June 1940, the first Commando raid took place. By the autumn of 1940 more than 2,000 men had volunteered and in November 1940 these new units were organised into a Special Service Brigade consisting of four battalions under the command of Brigadier J. C. Haydon. The Special Service Brigade was quickly expanded to 12 units which became known as Commandos. Each Commando had a lieutenant colonel as the commanding officer and numbered around 450 men (divided into 75 man troops that were further divided into 15 man sections). In December 1940 a Middle East Commando depot was formed with the responsibility of training and supplying reinforcements for the Commando units in that theatre. 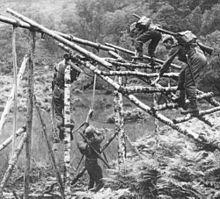 In February 1942 the Commando training depot at Achnacarry in the Scottish Highlands was established by Brigadier Charles Haydon. Under the command of Lieutenant Colonel Charles Vaughan, the Commando depot was responsible for training complete units and individual replacements. The training regime was for the time innovative and physically demanding, and far in advance of normal British Army training. The depot staff were all hand picked, with the ability to outperform any of the volunteers. Training and assessment started immediately on arrival, with the volunteers having to complete an 8-mile (13 km) march with all their equipment from the Spean Bridge railway station to the commando depot. Exercises were conducted using live ammunition and explosives to make training as realistic as possible. Physical fitness was a prerequisite, with cross country runs and boxing matches to improve fitness. Speed and endurance marches were conducted up and down the nearby mountain ranges and over assault courses that included a zip-line over Loch Arkaig, all while carrying arms and full equipment. Training continued by day and night with river crossings, mountain climbing, weapons training, unarmed combat, map reading, and small boat operations on the syllabus. Reaching a wartime strength of over 30 individual units and four assault brigades, the Commandos served in all theatres of war from the Arctic Circle to Europe and from the Mediterranean and Middle East to South-East Asia. Their operations ranged from small groups of men landing from the sea or by parachute to a brigade of assault troops spearheading the Allied invasions of Europe and Asia. The first modern special forces units were established by men who had served with the Commandos, including the Parachute Regiment, Special Air Service, and Special Boat Service. The Commandos were also widely imitated elsewhere: the French Naval commandos, Dutch Korps Commandotroepen, Belgian Paracommando Brigade, United States Army Rangers and United States Marine Raiders were all influenced to some degree by the British Commandos. The first modern special forces unit was the SAS, formed in July 1941 from an unorthodox idea and plan by Lieutenant David Stirling. In June 1940 he volunteered for the No. 8 (Guards) Commando (later named "Layforce"). After Layforce was disbanded, Stirling remained convinced that due to the mechanised nature of war a small team of highly trained soldiers with the advantage of surprise could exact greater damage to the enemy's ability to fight than an entire platoon. His idea was for small teams of parachute trained soldiers to operate behind enemy lines to gain intelligence, destroy enemy aircraft and attack their supply and reinforcement routes. Following a meeting with the C-in-C Middle East, General Claude Auchinleck, his plan was endorsed by the Army High Command. The force initially consisted of five officers and 60 other ranks. Following extensive training at Kabrit camp, by the River Nile, L Detachment, SAS Brigade undertook its first operations in the Western Desert. Stirling's vision was eventually vindicated after a series of successful operations. In 1942, the SAS attacked Bouerat. Transported by the LRDG, they caused severe damage to the harbour, petrol tanks and storage facilities. This was followed up in March by a raid on Benghazi harbour with limited success but they did damage to 15 aircraft at Al-Berka. The June 1942 Crete airfield raids at Heraklion, Kasteli, Tympaki and Maleme significant damage was caused, and raids at Fuka and Mersa Matruh airfields destroyed 30 aircraft. In the Burma Campaign, the Chindits, whose long range penetration groups were trained to operate from bases deep behind Japanese lines, contained commandos (King's Regiment (Liverpool), 142 Commando Company) and Gurkhas. Their jungle expertise, which would play an important part in many British special forces operations post war, was learned at a great cost in lives in the jungles of Burma fighting the Japanese. Immediately after the German occupation of Greece in April–May 1941, the Greek government fled to Egypt and started to form military units in exile. Air Force Lt. Colonel G. Alexandris suggested the creation of an Army unit along the lines of the British SAS. In August 1942 the Company of Chosen Immortals (Greek: Λόχος Επιλέκτων Αθανάτων) was formed under Cavalry Major Antonios Stefanakis in Palestine, with 200 men. In 1942, the unit was renamed Sacred Band. In close cooperation with the commander of the British SAS Regiment, Lt. Colonel David Stirling, the company moved to the SAS base at Qabrit in Egypt to begin its training in its new role. 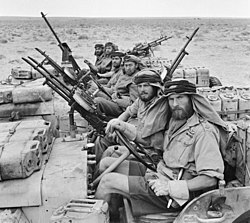 Operating under British direction, the special forces unit fought alongside the SAS in the Western Desert and the Aegean. Following advice from the British, Australia began raising special forces. The first units to be formed were independent companies, which began training at Wilson's Promontory in Victoria in early 1941 under the tutelage of British instructors. With an establishment of 17 officers and 256 men, the independent companies were trained as "stay behind" forces, a role that they were later employed in against the Japanese in the South West Pacific Area during 1942–43, most notably fighting a guerilla campaign in Timor, as well as actions in New Guinea. In all, a total of eight independent companies were raised before they were re-organised in mid-1943 into commando squadrons and placed under the command of the divisional cavalry regiments that were re-designated as cavalry commando regiments. As a part of this structure, a total of 11 commando squadrons were raised. They continued to act independently, and were often assigned at brigade level during the later stages of the war, taking part in the fighting in New Guinea, Bougainville and Borneo, where they were employed largely in long-range reconnaissance and flank protection roles. In addition to these units, the Australians also raised the Z Special Unit and M Special Unit. M Special Unit was largely employed in an intelligence-gathering role, while Z Special Force undertook direct action missions. One of its most notable actions came as part of Operation Jaywick, in which several Japanese ships were sunk in Singapore Harbour in 1943. A second raid on Singapore in 1944, known as Operation Rimau, was unsuccessful. United States Army Rangers at D-Day, Pointe du Hoc. The United States formed the Office of Strategic Services (OSS) during World War II under the Medal of Honor recipient William J. Donovan. This organization was the predecessor of the Central Intelligence Agency (CIA) and was responsible for both intelligence and special forces missions. The CIA's elite Special Activities Division is the direct descendant of the OSS. 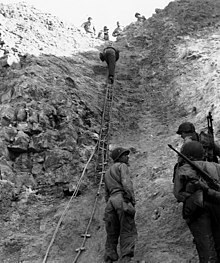 On February 16, 1942, the U.S. Marine Corps activated a battalion of Marines with the specific purpose of securing beach heads, and other special operations. 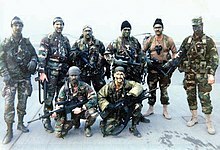 The battalion became the first special operations force of the U.S. The battalion became known as Marine Raiders due to Admiral Chester Nimitz's request for "raiders" in the Pacific front of the war. In mid-1942, Major-General Lucian Truscott of the U.S. Army, a liaison officer with the British General Staff submitted a proposal to General George Marshall that an American unit be set up "along the lines of the British Commandos", resulting in the formation of the United States Army Rangers. The United States and Canada formed the 1st Special Service Force as a sabotage ski brigade for operations in Norway. Later known as the "Devil's Brigade" (and called "The Black Devils" by mystified German soldeiers), the First Special Service Force was dispatched to the occupied Aleutian Islands, Italy and France. Merrill's Marauders were modelled on the Chindits and took part in similar operations in Burma. In late November 1943, the Alamo Scouts (Sixth Army Special Reconnaissance Unit) were formed to conduct reconnaissance and raider work in the Southwest Pacific Theater under the personal command of then Lt. General Walter Krueger, Commanding General, Sixth U.S. Army. 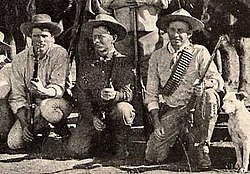 Krueger envisioned that the Alamo Scouts, consisting of small teams of highly trained volunteers, would operate deep behind enemy lines to provide intelligence-gathering and tactical reconnaissance in advance of Sixth U.S. Army landing operations. In 1983 the US Army created the Special Forces Tab. It was later decided that personnel with at least 120 days' wartime service prior to 1955 in certain units, including the Devil's Brigade, the Alamo Scouts and the OSS Operational Groups, would receive the Tab for their services in World War II, placing them all in the lineage of today's U.S. and Canadian (via Devil's Brigade) Special Forces. The Axis powers did not adopt the use of special forces on the same scale as the British. The German army's Brandenburger Regiment was founded as a special forces unit used by the Abwehr for infiltration and long distance reconnaissance in Fall Weiss of 1939 and the Fall Gelb and Barbarossa campaigns of 1940 and 1941. Otto Skorzeny (left) and the former Brandenburger Adrian von Fölkersam (middle), 1944. Later during the war the 502nd SS Jäger Battalion, commanded by Otto Skorzeny, sowed disorder behind the Allied lines by mis-directing convoys away from the front lines. A handful of his men were captured by the Americans and spread a rumor that Skorzeny was leading a raid on Paris to kill or capture General Dwight Eisenhower. Although this was untrue, Eisenhower was confined to his headquarters for several days and Skorzeny was labelled "the most dangerous man in Europe". In Italy, the Decima Flottiglia MAS was responsible for the sinking and damage of considerable British tonnage in the Mediterranean. Also there were other Italian special forces like A.D.R.A. (Arditi Distruttori Regia Aeronautica). This regiment was used in raids on Allied airbases and railways in North Africa in 1943. In one mission they destroyed 25 B-17s. The Imperial Japanese Army first deployed army paratroops in combat during the Battle of Palembang, on Sumatra in the Netherlands East Indies, on 14 February 1942. The operation was well-planned, with 425 men of the 1st Parachute Raiding Regiment seizing Palembang airfield, while the paratroopers of the 2nd Parachute Raiding Regiment seized the town and its important oil refinery. Paratroops were subsequently deployed in the Burma campaign. The 1st Glider Tank Troop was formed in 1943, with four Type 95 Ha-Go light tanks. The paratroop brigades were organized into the Teishin Shudan as the first division-level raiding unit, at the main Japanese airborne base, Karasehara Airfield, Kyūshū, Japan. However, as with similar airborne units created by the Allies and other Axis powers, the Japanese paratroops suffered from a disproportionately high casualty rate, and the loss of men who required such extensive and expensive training limited their operations to only the most critical ones. Two regiments of Teishin Shudan were formed into the 1st Raiding Group, commanded by Major General Rikichi Tsukada under the control of the Southern Expeditionary Army Group, during the Philippines campaign. Although structured as a division, its capabilities were much lower, as its six regiments had manpower equivalent to a standard infantry battalion, and it lacked any form of artillery, and had to rely on other units for logistical support. Its men were no longer parachute-trained, but relied on aircraft for transport. Some 750 men, mainly from the 2nd Raiding Brigade, of this group were assigned to attack American air bases on Luzon and Leyte on the night of 6 December 1944. They were flown in Ki-57 transports, but most of the aircraft were shot down. Some 300 commandos managed to land in the Burauen area on Leyte. The force destroyed some planes and inflicted numerous casualties, before they were annihilated. During World War II, the Finnish Army and Border Guard organized sissi forces into a long-range reconnaissance patrol (kaukopartio) units. These were open only to volunteers and operated far behind enemy lines in small teams. They conducted both intelligence-gathering missions and raids on e.g. enemy supply depots or other strategic targets. They were generally highly effective. For example, during the Battle of Ilomantsi, Soviet supply lines were harassed to the point that the Soviet artillery was unable to exploit its massive numerical advantage over Finnish artillery. Their operations were also classified as secret because of the political sensitivity of such operations. Only authorized military historians could publish on their operations; individual soldiers were required to take the secrets to the grave. A famous LRRP commander was Lauri Törni, who later joined the U.S. Army to train U.S. personnel in special operations. Admiral William H. McRaven, formerly the ninth commanding officer of the U.S. Special Operations Command (2011–2014), described two approaches to special forces operations in the 2012 posture statement to the U.S. Senate Committee on Armed Services: "the direct approach is characterized by technologically enabled small-unit precision lethality, focused intelligence, and inter-agency cooperation integrated on a digitally-networked battlefield", whereas the "indirect approach includes empowering host nation forces, providing appropriate assistance to humanitarian agencies, and engaging key populations." Elements of national power must be deployed in concert without over-reliance on a single capability, such as special forces, that leaves the entire force unprepared and hollow across the spectrum of military operations. Throughout the latter half of the 20th century and into the 21st century, special forces have come to higher prominence, as governments have found objectives can sometimes be better achieved by a small team of anonymous specialists than a larger and much more politically controversial conventional deployment. In both Kosovo and Afghanistan, special forces were used to co-ordinate activities between local guerrilla fighters and air power. Irish Army Ranger Wing operators during patrol in Chad, 2008. Typically, guerrilla fighters would engage enemy soldiers and tanks causing them to move, where they could be seen and attacked from the air. Special forces have been used in both wartime and peacetime military operations such as the Laotian Civil War, 1971 Indo-Pakistan War, Vietnam War, Portuguese Colonial War, South African Border War, Falklands War, The Troubles in Northern Ireland, the Jaffna University Helidrop, the first and second Gulf Wars, Afghanistan, Croatia, Kosovo, Bosnia, the first and second Chechen Wars, the Iranian Embassy siege (London), the Air France Flight 8969 (Marseille), Operation Defensive Shield, Operation Khukri, the Moscow theater hostage crisis, Operation Orchard, the Japanese Embassy hostage crisis (Lima), in Sri Lanka against the LTTE, and the raid on Osama Bin Laden's compound in Pakistan. The U.S. invasion of Afghanistan involved special forces from several coalition nations, who played a major role in removing the Taliban from power in 2001–2002. Special forces have continued to play a role in combating the Taliban in subsequent operations. As gender restrictions are being removed in parts of the world, females are applying for special forces units selections and in 2014 the Norwegian Special Operation Forces established an all female unit Jegertroppen (English: Jeger Troop). This page is based on the Wikipedia article Special forces; it is used under the Creative Commons Attribution-ShareAlike 3.0 Unported License (CC-BY-SA). You may redistribute it, verbatim or modified, providing that you comply with the terms of the CC-BY-SA.